I really loving this snowman. Aren’t they adorable?!!! They are called Flaky Friends. I’ve used my copics again. (That’s definitely a theme with me. I think I need to challenge myself to use another medium. 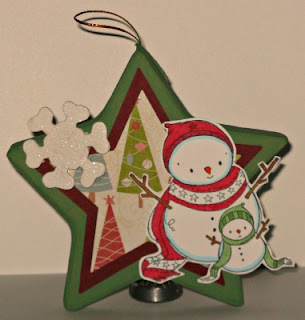 lol) I used some leftover Christmas paper I had in my stash from last year to make the star stand out. The star is a paper mache star that I bought at my local crafting store. I painted it with acrylic paints and then added the paper and glittered up snowflake. Lastly I popped the image on to it. It’s a great tree decoration and quick to whip up for a gift as well. It’s quite inexpensive to make, so it would be great to have a few around the house for surprise guests. I hope that you will try an ABAC project along with us. Please link us up to your post, so that we can check out your creations! Super fab! I am really going to have to try this out with my girls during Christmas. They would just love making these! A great gift idea for Grandma and Grandpa too!